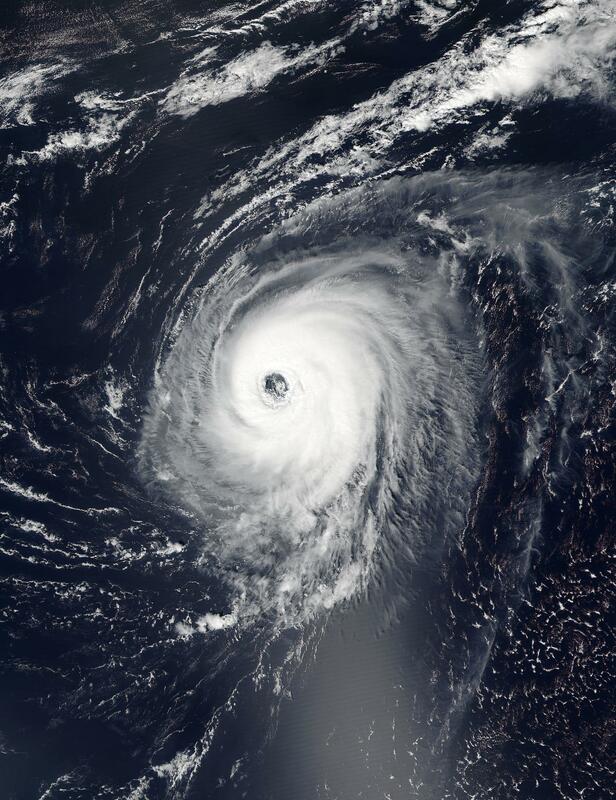 NOAA's Suomi NPP satellite passed over Hurricane Gaston as it continued to track over the open waters of the North Central Atlantic Ocean and move farther away from Bermuda and toward the Azores Islands. On Aug. 30 12:25 p.m. EDT (1625 UTC) the Visible Infrared Imaging Radiometer Suite (VIIRS) instrument aboard the NASA-NOAA Suomi NPP satellite captured a visible light image of Gaston. The VIIRS image revealed that the large cloudless eye surrounded by very powerful thunderstorms. On Aug.31, the National Hurricane Center noted that although Gaston is 1,335 miles (2,150 km) west of the Azores islands in the western Atlantic Ocean, the storm may affect the islands later in the week. NHC cautioned that interests in the Azores should monitor the progress of Gaston. At 5 a.m. EDT (0900 UTC), the well-defined eye of Hurricane Gaston was located near latitude 33.4 North, longitude 50.2 West. Gaston is moving toward the northeast near 9 mph (15 km/h). An east-northeastward or northeastward motion with an increase in forward speed is expected during the next couple of days. Maximum sustained winds remain near 120 mph (195 kph) with higher gusts. Gaston is a category 3 hurricane on the Saffir-Simpson Hurricane Wind Scale. Little change in strength is expected today, Aug. 31 but weakening should begin tonight or early Thursday, Sept. 1. The estimated minimum central pressure is 956 millibars. Hurricane-force winds extend outward up to 45 miles (75 km) from the center and tropical-storm-force winds extend outward up to 160 miles (260 km). NHC forecaster Avila noted "Gaston is over warm waters and the shear is expected to increase just a little during the next day or two. Consequently, only a slight weakening is anticipated during the day or so. After that time, Gaston should encounter cooler waters resulting in a faster weakening. By the end of the forecast period, Gaston should become absorbed by another extra-tropical cyclone." For updated forecasts from the NHC, visit: http://www.nhc.noaa.gov.